My Auntie Alma gave me old photo's for Christmas. She heard that I was collecting old black and white photo's of ladies in swimsuits (or any old photo's for that matter). I can't wait to hang some in my bathroom. She was, and still is, a fox. Anyhow, she also found this one of my Mother. 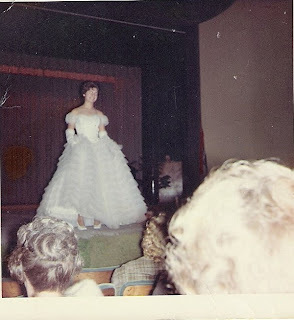 She was the Farm Bureau Queen in Cape Girardeau, Missouri, in 1963. "This is Shirley on the stage. She doesn't like it but it will give you and Lillie both an idea where she was when she tripped on a board just as Carol took picture. " My Mommy gave me this white vanity case as a Christmas gift. She told me the story about how it was presented to her when she was crowned as the Farm Bureau Queen. They also gave her a red wallet and the tiara that she had to give to the next queen the following year. I was so thrilled when I realized that my two Christmas treasures carried so much familial history. While I was home I read a lot of my Mommy's magazines. 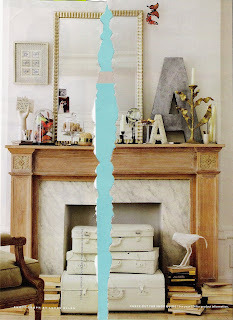 She had the O at Home magazine and I fell in love with this mantel. I did a cheese ball job of scanning the photo but I know you're all still cool with me (I hope). I really like how they painted the suitcases but I don't think I would ever be able to do that to such beautiful finds. When I was in my closet taking photo's this morning I decided to take a photo of this for you. My Daddy gave me this photo of my Great Grandmother Bradshaw. He thought I looked like her. What do you think? p.s. Here is Auntie Alma looking pretty foxy. Oh my goodness, I had no idea your mom was a beauty queen! What a spectacular dress and what precious memories. I love all these photos. I wish I had more of my Mom when she was younger. Your Mom and Auntie Alma are super beautiful! I'm still cool with you. I love those pictures. What a beautiful framed picture of your Great Grandmother Bradshaw. I might see a resemblance of you in her. It would be easier to tell if we put some beautiful thick long dark hair on her. How nice to have such beautiful and meaningful things from your family. I think that you have a similar nose. Things are good here, I'm going to need to call you soon for a full up-date.